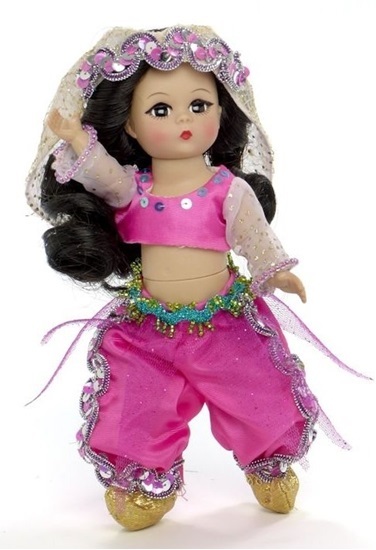 From Madame Alexander's International Collection, we are pleased to share "Sherezade", an 8-inch fully articulated Wendy with brown eyes, and long wavy black hair. She is wearing a classic storytelling costume consisting of bright pink harem pants and a matching midriff top. Gold sequins trim the side of the pants, turquoise ric-rac with green beads and pink sparkle net, is wrapped around her waist in a belt. Blue sequins at the neckline and sleeves made of a light sheer lavender with sparkly gold dots enhance this beautiful ensemble. A gold lace veil lined with sheer lavender and purple sequins covers her hair, and metallic gold fabric shoes with upturned toes completes this look.